Where can you stream Star vs. the Forces of Evil? On 2015-01-18 Action & Adventure/Animation TV Series Star vs. the Forces of Evil first aired on Disney XD. 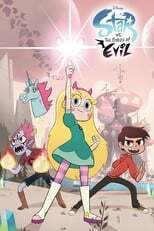 Written and created by Daron Nefcy & Jordana Arkin, and produced by Walt Disney Television Animation, Star vs. the Forces of Evil will return and was last broadcasted on 2019-04-14.